This is an alpine swift. You can tell by the name that it’s a fast bird, but its real talent has just recently been discovered. It spends over half of the year in the air. 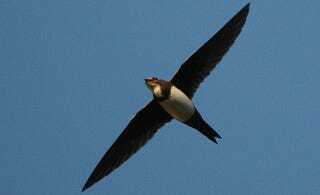 Then scientists from the Swiss Ornithological Institute put trackers on alpine swifts in Switzerland and observed the migrations that the birds made from western Europe to western Africa. In Europe, the birds were day-fliers. They gathered food during the day, and spent their nights roosting and sleeping. As they moved towards Africa, they often flew through the night. Once they got to Africa, the birds didn’t stop moving, ever. Day and night, they flew. Their wintering in Africa lasted just under seven months, and, as far as the researchers could tell from the data on the birds’ trackers, the birds must have eaten whatever they could catch in the air, and slept while flying. Although the researchers concede the swifts might have touched the ground somewhere, the birds couldn’t have stopped for more than a few minutes at a time. The trackers recorded the bird’s body position every four minutes. How do they manage? It’s possible, the scientists think, that alpine swifts sleep the way dolphins do. When one half of the brain goes to sleep, the other half keeps the bird airborne and alive, and then the other half of the brain takes over. What’s amazing is these birds spend more time every year exclusively in the air than they spend alternating between flying and roosting. Even if the birds spent the rest of their year waddling from place to place, they’d still be more aerial than terrestrial. Top Image: Vogel Warte. Second Image: Pau Artigas.